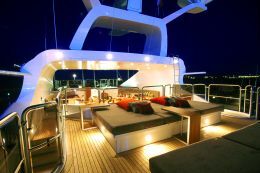 NAUTICALweb - Lighting design aboard: a possibility? Light is one of the revelatory elements of life, the visual counterpart of that other animating force which is heat, and it allows our eyes to penetrate the meaning of life which is perennially renewed. It has no body, cannot be touched, it can propagate itself through space at dizzying speed, yet it interacts with the matter that transmits and absorbs it, reflects it, diffuses it or even, under suitable conditions, generates it. Light, understood in the most poetic sense of the term, has never found - except perhaps in recent times - a visible correspondence in the sailing world. 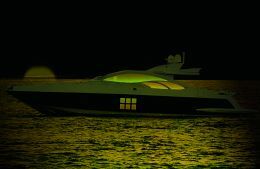 The cause is essentially traceable to the lack of a light-making culture which, though it has played a leading role in architecture and urban scenarios over the last decade, hesitates to find its dimension in yacht design. Certainly some of the reasons must also be sought in the spatial and structural limitations that have always prevented the use, or even only the thought of using certain apparatus or sources. Moreover, in the context of rationalising the overall costs of a vessel, its "light" may be subject to economic revisions and checks. Another great limitation, even in only proposing new lighting bodies, comes from the regulations to which they are subject. Regulations which call for certain features, including the emission temperature, which must necessarily lie within the established safety values with view to avoiding problems of overheating of both the sources and the materials near the apparatus. The consequent risks range from simple blackening of surfaces to the breakage of facing panels and to more serious cases of potential fire on board. Likewise, the advent of movements and styles borrowed from architecture and interior design have supplied a pretext for extending the boundaries of the "light" theme, reformulating it under other points of view. A great help also comes from the development of innovative technologies aimed at miniaturisation of light sources, together with an improvement of lighting technique properties such as duration and low heat emission. Once more the yachting sector has found itself having to pursue things which other disciplines had already embraced. 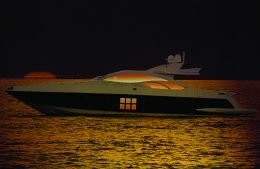 Just as paints, technopolymers and facings in materials that a few years ago could not be suggested for a boat have now entered the shipyards with flying colours, so the theme of "light" is at last approaching the horizon. At least we are starting to see, with pleasure, medium and large vessels in whose compositional genesis we perceive the designer's sensitivity with regard to space, to the illuminated object. What then are the future possibilities on the theme of light in yacht design? First of all it is important to analyse the potentialities concealed in boats seen from the outside. Architectonic light: in this sense the boat is no longer understood as a unitary organism (moreover it's already difficult to think of it as such) but as an object consisting of geometries that lead back to spaces, surfaces, volumes, masses, to fullness and emptiness. It is in this morphological analysis that the object 'boat' is enriched by new values and meanings, by features that distinguish it from others. We shall be able to give it more interpretative keys that offer various sources of inspiration for lighting design. A sign, a muscle, an empty space, a shoal. these are all elements which may be illuminated, or by means of which light may draw its origin. Often when strolling along the quay in the evening one is marvellously struck by the magnificence of moored boasts, seen in a triumph of lights and glows of every kind. But the poetics of light is another thing: an instrument as powerful as it is dangerous, it can flatten an object and make it lose all three-dimensionality while, contrarily, it can emphasis forms and geometries. Dynamic light: Water, land, atmospheres, places passed through. the boat necessarily comes into contact with one or more of these elements, be they tangible, material or ethereal, changeable, in brief, "of the moment". Considering a yacht as complement of a scene, of a place, we see that from being the absolute star it becomes, like in an expressionist painting, an integrating part of a unique whole, vitalised by the light that ceaselessly brushes and changes the material nature of things. Another scenario of lighting on boats is concretised in the concept of the moment, of active and striking light, present in all living things, in the representation of a reality in continuous movement. Entering the boat, the scenario we are faced with is somewhat undertone. 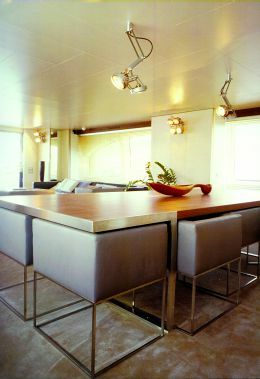 Without criticising the lighting technique quality of the apparatus, whose value is unquestionable, the morphologies and the very conception of light itself on board a boat are still seen "too much" as a final complement to a complex design and "little" as an instrument that may come in upstream of architecture and - why not? - of structure. The greatest effort to date has been to adapt or, more often, to directly mount apparatus of "civilised" origin, immediately recognisable as apparatus with a high stylistic content but perhaps not capable of demonstrating that the boat has been subject to actual lighting design. Unquestionably there are exceptions to these assumptions, but they are exceptions traceable mainly to customised architectural designs for large size vessels in which the designer is also a connoisseur of civil architecture. In this context, shipyards would do well to increase their awareness of the light theme and grasp the deep meanings and enormous potentials that lie behind lighting design, not merely by delegating the evocative and sensorial power innate in a gem of a boat to the use of colour and various gel-coats but by exploiting the immateriality and warmth which only light can give. These are only a few "visions" worth analysing and reflecting on prior to fine-tuning the technologies and suitable methodologies for realisation of such scenarios. The problem of light must be approached right from the compositional genesis of the boat, as a design element to keep in mind while thinking of both the interior - which light itself may generate spatially and structurally - and the exterior where light becomes an instrument which is functional and which supplies volumetric highlighting. In the phase of design and optimisation of systems, the choice of light sources, lighting bodies and electrical components takes on fundamental importance. The musts are: energy saving, lowering and control of heat sources, resistance to continual vibrations, miniaturisation and compatibility of installation with the structures and reduced thicknesses of the boat system, compatibility with the (permitted) standard voltages and reduction of maintenance time. Over and above requirements of a functional and structural type, the choice of light sources is also conditioned by restrictions of a quantitative and qualitative nature, defined in the lighting technique design phase. 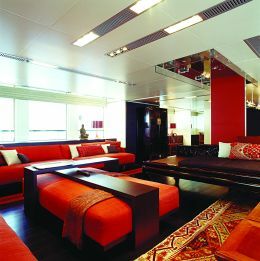 In particular the sources must ensure the visual comfort dictated by envisaged levels of illumination (lux) and luminance (cd/m2) and, with view to respecting and highlighting the qualities of materials and colours decorating the interior and exterior spaces, must have a high chromatic yield (Ra) and control of the colour temperature (K). In the current and probable future scenario of light sources, LEDs (light emitting diodes) represent a break with the past and a setting forth into the culture of making light aboard vessels which, until yesterday, was based on the use of optic fibres and spots with low voltage halogen sources. LEDs sidestep the plant engineering and functional requirements mentioned above and moreover have a working life of around 40.000-50.000 hours, so maintenance is considerably reduced. But the true revolution lies in their small size and their lighting technique features which permit new forms of hardware and new lighting concepts. Essentially "bare" LEDs, assembled in linear, square and round modules, find their role through the lighting designer's creativity. He may decide to emphasise them with a body or to conceal them from the observer's view, exploiting only the lighting effect. Diodes, with their structural and functional features, offer the designer the chance to mould light in relation to the surfaces and complex geometries of the boat. Moreover, the latest generation RGB LEDs, integrated with advanced control systems, open new application horizons in the use of coloured light. From additive synthesis mixing of red, green and blue light, any colour may be obtained. 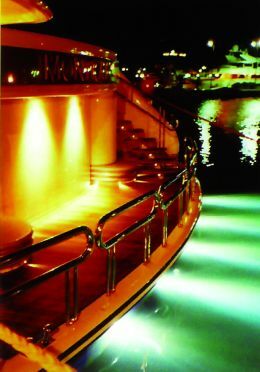 Through the instrument of coloured light the designer has first of all the chance to experiment with new forms of aesthetic valuation that generate psychical and emotional reactions, and in particular to renew the traditional, static and precise image of the boat. 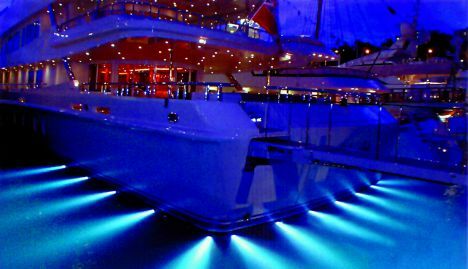 With a dynamic- type handling of lights, the lighting designer can coordinate the play of light and colours in function of the lighting concept, putting the boat into relationship (as said previously) with external and variable factors: the passing of time from dawn to sundown, the turning of the seasons, temporary mooring at the quay or in the roadstead . An area yet to be explored in the light source scenario, but of considerable interest, is the Philips Long Life T1 cold cathode lamp: T1 is a miniaturised cold cathode tubular lighting system, extremely compact and long lasting, with high luminosity and emission and available in two colour temperatures, 2700 and 4000 K.
It is therefore clear that by fully exploring and experimenting with lighting technologies it will be possible to satisfy the requirements of an integrated design of lighting and architecture. But this is only the starting point of a discipline, Lighting Design, found on boats still in the embryonic phase. In his work the lighting designer does not aim to be a lights technician. He seeks a compromise between art and science, since it is only through interaction between these two spheres that design will be illuminated by an "esprit nouveau".